Kentucky donors: Prove you Bleed Blue! Save a life, and show your Wildcat pride. Donate blood Nov. 12–16 to help Kentucky notch another win over Tennessee in the 31st annual Big Blue Crush blood battle. 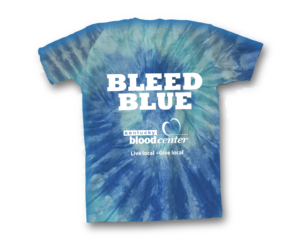 All donors will receive a commemorative Big Blue Crush tie-dye T-shirt and a chance to win tickets to the UK vs. Louisville football game. UK campus donors will receive a $10 Amazon gift card and a chance to win a Series 4 Apple Watch. On Friday, UK donors can enjoy Papa John’s pizza at the Singletary Center and Chick-fil-A nuggets and cookies at the Student Center (while it lasts). KBC’s six donor centers will be open Monday through Friday, 9 a.m. – 7 p.m. during Crush. Call 800-775-2522 x3758 to find a Crush blood drive or schedule an appointment. If you joined the Bleed Blue Donor Club earlier this year, your Crush donation will put you just one donation closer to receiving a KBC Weekender Duffel Bag. Get it during Big Blue Slam. The 2018 Big Blue Crush will mark the 31st edition of this friendly competition between the blood donors of Kentucky and Tennessee. The Commonwealth holds an overall Crush lead of 17-12 with one tie and has won the past eight consecutive blood battles. It’s a fun tradition, but most importantly, Crush donations help ensure enough blood is on the shelves for the thousands of Kentucky and Tennessee patients who will require transfusions during the holiday season.